We take a look ahead to the Premier League crunch clash between Tottenham Hotspur and Manchester United from Wembley. Given that manager Pochettino has been consistently linked with the permanent vacancy at Old Trafford, there will no doubt be an extra edge in the air when the sides take to the field on Saturday. 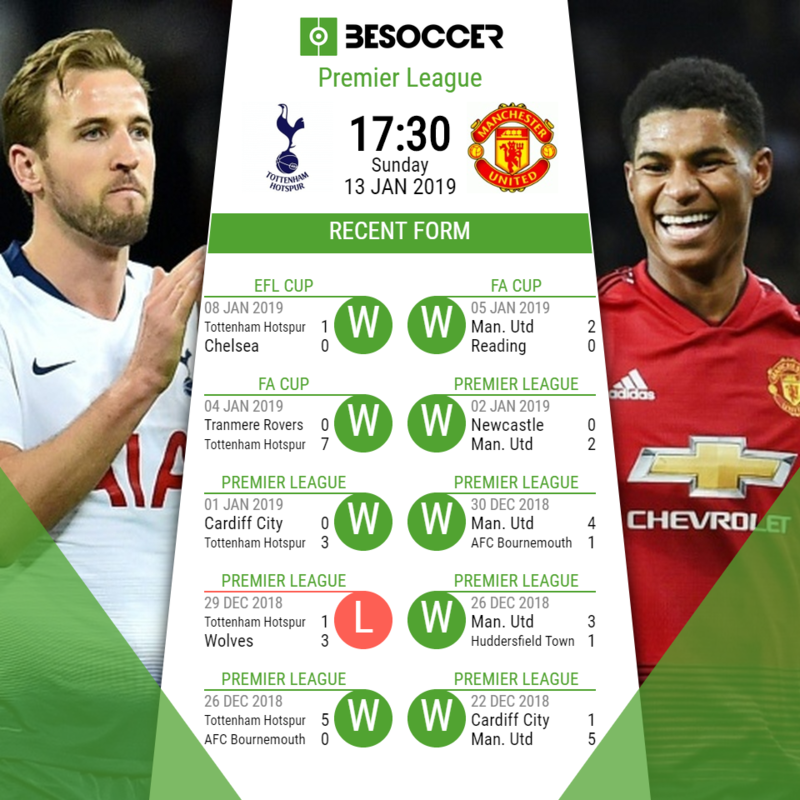 Tottenham could move back up to second place with a win, although this could also turn out to only be temporary, depending on how rivals Manchester City perform at home to Wolves on Monday. Tottenham have won 15 of their last 18 matches in all competitions, including three victories since the turn of the new year. That said, no side is as well versed in slipping up in recent years than 'Spurs'. Their renewed presence in all four competitions is encouraging, but it has reached the point where a piece of silverware this season is almost a necessity. Regarding team news for this crunch clash, Tottenham will be without Mousa Dembele, as it seems that a departure to the Chinese Super League is all but complete. Aside from that, Pochettino has a full compliment of stars to choose from. Amid all of the rumours surrounding his adversary this weekend, Ole Gunnar Solskjaer retains high hopes of keeping the reigns at Old Trafford come the end of the season. That said, it would be a good audition for the Norwegian to beat his top rival for the role, in what is undoubtedly his toughest test yet in the United hot seat. United will hold hopes of continuing their resurgence under Solskjaer at Wembley, with five consecutive wins behind them going into the clash. So, in terms of absentees for the 'Red Devils' on Sunday, Alexis Sanchez is doubtful to appear, after limping out of the side's FA Cup win over reading last week. Likewise, the match arrives too soon for Chris Smalling, who is also recovering from a knock, and Eric Bailly, who remains suspended. One key returnee though is Frenchman Paul Pogba, who is back at full fitness after recovering from a leg injury sustained against Newcastle. "All the games are so important because we are going to play for three points. My feeling after Wolves and Watford when we lose is the same feeling when you lose against Liverpool or another team. Always it’s special to play – you play for your objectives, your pride." "You always adapt to any opposition we play. You all know the best teams in the league and of course we have to be aware of their strengths. But I've been brought up in a way that we need to attack teams. I think that's our strength as well, going forward and attacking as a team when you look at us now, the way we've played." In the last eight fixtures between the two teams in all competitions, the sides have alternated between wins and defeats. If Tottenham win this weekend, it will be the first time that they have recorded back to back wins against United since 1990. United have not won away at Tottenham since March 2012, and have also lost their last three visits to the home of the 'Lilywhites'. Tottenham Hotspur: Lloris; Trippier, Sanchez, Alderweireld, Rose; Sissoko, Winks, Alli, Eriksen; Son, Kane. Manchester United:De Gea; Young, Lindelof, Jones, Shaw; Herrera, Matic; Lingard, Pogba, Martial; Rashford.